I love free food, but come on, who doesn’t? 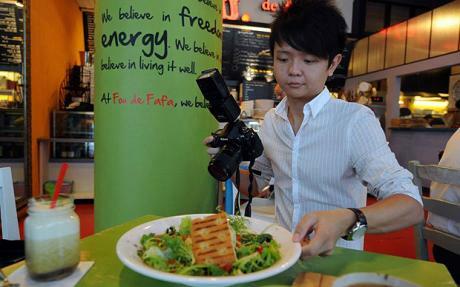 So why don’t we all just become food bloggers like Mr Brad Lau? Then we all can get invited to restaurants to eat for free. Mr Lau was invited for a free “food-tasting session” at a restaurant with a guest, but the food blogger brought three guests. There was a misunderstanding and the meal turned out not to be so free after all. And not just in terms of cash. News of the incident went viral and Mr Lau has been vilified as a freeloader. Hey, I’m a freeloader and proud of it. I also used to get invited for free food all the time when I wrote for a magazine and I didn’t even write about food at all. Journalists are typically inundated with invitations to media events, big and small, almost everyday. I just tried to attend the ones that promised the best free food. And the public relations people know this, so they wittingly use grub to lure the media to their events, hoping for coverage. Did that compromise whatever leftover morsel of "journalistic integrity" I had left? No, because l hardly ever intended to write about any media event that I attended. I was there only for the buffet and any other free stuff I could score. It got to the point where I even stopped pretending to care what the event was about. I became so bored that I started amusing myself by testing how boorish I could behave before someone asked me to leave, which shockingly, no one ever did. But my editor did receive a number of complaints and threats the day after. And yet, I was still being sent to events that I wasn’t expected to write about. How many times did I have to tell Kenny G I hated him at a press conference before I get banned? Ah, good times. That’s the power of the press for ya. Then I realised the food wasn’t really free. I was paying for it by sitting through all these tedious press conferences and enduring all those insufferably ingratiating PR people (although they were usually attractive young women in tight skirts and high heels). I also hated that I kept seeing the same “journalists” again and again at these events because we were on to each other’s game. No amount of free food was worth participating in the hypocrisy of the PR process (even with the attractive young women in tight skirts and high heels). I no longer write for a magazine. Nowadays, no one even sent me a free pizza when I recently wrote a column in The New Paper about Pizza Hut’s Goooal! Splitzza being the most exciting thing about the World Cup. So sad. But then I’m not a food blogger. Yet. I need a name for my new food blog. How about SotongBall.com? So I was taking my mother to the recent Phua Chu Kang movie “gala” premiere at VivoCity. Unless she leads a secret double life as Angelina Jolie, I believe it was the first movie premiere she had ever attended. I thought she would be excited about meeting the actors like PCK star Gurmit Singh... okay, maybe not Gurmit Singh, but being a Channel 8 viewer, she had once mentioned that she thought Henry Thia was funny. But, noooooo, all she did was whined about how she now has to pay more to ride the MRT. I couldn’t believe it. My movie premiere was being upstaged by the new distance-based fare system. Of course, my mother isn’t the only one unhappy with the new fare system implemented last month. Enough people complained that it was brought up last week in Parliament where Transport Minister Raymond Lim defended the distance-based fares by citing studies by the Public Transport Council (PTC), but conceded that some people, particularly senior citizens like my mother, have to pay more. It didn’t help that the train operators have admitted to numerous instances where commuters were overcharged by mistake. I think the people running our public transport system have a serious credibility problem. Year after year, the PTC releases a report about how the quality of our public bus services is getting better. PTC members have obviously never waited 40 minutes for a bus in the rain before. And when the bus finally comes, you can’t get on it because it’s packed tighter than a sausage filled with ground human meat. Mmm ... sausage. Every few years, there will be a bus, train or taxi fare increase, and the PTC will be there to justify those increases. At what point did the PTC become an apologist for the transport companies rather than an advocate for commuters? I would go so far to say that more people hate the new fare system than the PCK movie. You can always choose not to watch the PCK movie (like I have), but many people like my mother and me) can’t afford not to take public transport. 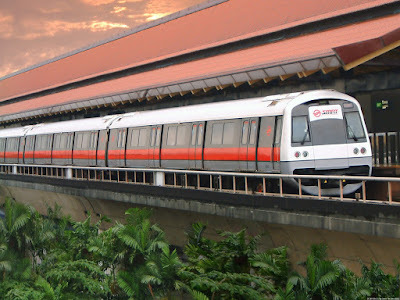 But of course, it’s unlikely we will return to the old fare system despite the criticisms. As in the previous fare increases, the storm will eventually blow over and we will learn to live with the new fares. That is, until the next time they change the fares again and the cycle starts all over. By then, I can take my mother to the premiere of Police & Thief The Movie. Eugene from the production company that produced Phua Chu Kang The Movie had arranged two tickets for me to attend the movie’s “gala” premiere two weeks ago. I told him I was taking my mother and sister. Oh, he said, he would arrange a third ticket for me. I told him not to because I was skipping the movie screening. Eugene’s confusion was audible over the phone. How could I not support the movie since I was the credited scriptwriter, he wanted to know. I said I did support the movie (otherwise I wouldn’t be forcing my own flesh and blood to sit through it) – I just didn’t want to see it. I had seen the PCK movie trailer and was dismayed by the number of things in it that I didn’t write. If a two-minute trailer could cause me so much stress, sitting through the 100-minute movie could give me a cardiac arrest. I’m not a young man any more. This is not unprecedented. One of my first TV jobs was reviewing movies on Channel 5 back in 1994. After every show, I would rush to call my girlfriend and ask her to review my review because I was terrified of watching myself on TV. And even though I created and wrote the two TV series Ah Girl and Lifeline, I have never seen a single episode of both shows apart from the pilots. Instead, I forced my girlfriend-turned-wife to watch the shows and review them for me. The only shows I had worked on that I could bear to watch were those where I had some control over the editing and music. I guess I’m just a control freak. Too bad for me I wasn't the executive producer and director of the PCK movie, like I was of the original TV show's final season. About two hours after dropping my mother and sister off at the PCK movie screening, I called to ask them what they thought of the movie. My mum said it was “not bad” and “meaningful”. Not exactly the ringing endorsement one would hope from one’s own mother. My sis said she slept through most of the movie. What?! How could she fell asleep in the middle of her big brother's movie at its “gala” premiere? That was just, well, rude. Her excuse: It was like a Jack Neo movie and therefore, she was not the target audience. As if to make me feel better, my sister said that many people (but not her) enjoyed Jack Neo movies and so the PCK movie should be very successful. Of course that was our diabolical plan all along. That was why long-time Jack Neo accomplices Boris Boo and Henry Thia were hired to direct and ham it up in the PCK movie respectively. It even has a lot of Hokkien and bad reviews like a Jack Neo movie. 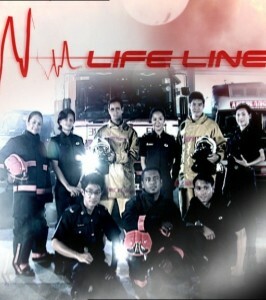 Now if only it would make money like a Jack Neo movie. I’m sending my wife to watch the PCK movie today. She better not fall asleep. PCK movie: The reviews are in ... and mean! Phua Chu Kang The Movie opens this weekend. I had worked on it as a scriptwriter. The reviews have been mostly pans. Now it's a matter of how it does at the box office. After Singapore, there's still the Malaysian market. It is high time Phua Chu Kang had a fatal construction site accident. An hour into the insult to the audience that is Phua Chu Kang The Movie, my mind, wild with rage, fantasised a grisly end to a character long ago bled dry of any entertainment value. Inside the dream script, Rosie, his wife played by Irene Ang, would get her lover, Frankie Foo (Lim Kay Siu), to run him over with a bulldozer and bury his body in concrete. The concrete would be in the foundation of an English-language school, naturally. Foo should in turn be poisoned by Rosie, who would ride off on the back of labourer King Kong’s motorcycle, its spinning tyres leaving a black streak on the slab over Phua’s corpse. The grubby, chaotic, sponsor-intruding-grab-for-dollars that this film is will bring tears to anyone who remembers how startlingly good the MediaCorp sitcom PCK Pte Ltd was when it launched in 1996. Everything about it was low-budget sitcom standard-issue, from the cheap sets to the obvious jokes to the flabby plots. But the character of Phua Chu Kang knocked viewers out. Ah Bengs are a staple of local entertainment, but no actor had pumped in as much verve as the then fresh-faced Gurmit Singh. His pitch-perfect Benglish and gift for physical comedy prove that great line delivery can rescue lousy writing. His style owed a lot to Jim Carrey but everyone was stealing from the American actor during that period. The problem is that today, Singh still plays PCK like the way Carrey played Ace Ventura: Pet Detective, a movie released 15 years ago. The comedy world has moved on, but someone forgot to send a memo to the PCK creative team. Characters in a TV series must grow with every season, but the sitcom, from the time it wrapped in Singapore in 2007 to its current status as the spinoff Phua Chu Kang Sdn. Bhd. in Malaysia last year, has stubbornly gone in the opposite direction. Instead of evolving, the comic creation has been cynically boiled down into a bunch of catchphrases in a pair of yellow boots by writers and producers who think jokes get funnier the more you repeat them. Singh, in a recent interview, has said he is proud of the movie and of the character and will keep on doing PCK as long as the public still wants him. Is he being deliberately naive? He should know that smart creators retire beloved TV characters all the time. Being professional is not about whether you can still fool some of the people some of the time, it is about integrity. It is about whether you prefer to be remembered as a star who left while on top of his game or as a businessman looking to milk every last drop of revenue. Singh’s career teaches that for an artist, success can be worse than failure. Singh and his employer MediaCorp could have chosen the classy option some years ago. Phua Chu Kang would have been a fond memory and a cult phenomenon, like David Brent from the original BBC production of the hit sitcom The Office. Instead, the contractor has become The Fonz from the American sitcom Happy Days, who by refusing to acknowledge his sell-by date, went from being cool to being a joke. Anyway, if the character will not expire at the hands of its creators, perhaps this film will do the job. It is so awful that it feels as if everyone involved hates the character. Like Caesar’s assassins, it looks as if they all ganged up to rub him out. The movie is bad in the same way bad MediaCorp sitcoms are bad, only it is much, much longer. Grimaces and howls replace acting. Primary school-level Hokkien puns abound. The chaotic plot feels thrown together from three episodes fished from the discard pile. Phua Chu Kang’s character is wildly inconsistent from scene to scene. Is he smart or stupid? Is he selfish or generous? Nobody knows, least of all the film’s writing team and director Boris Boo. The worst crimes against comedy are the slapstick sequences, which are obviously intended to pad out the running time. These scenes come off like an idiot’s version of Benny Hill. There is the standard speeded-up conga-line chase scene, but to add insult to injury, the bit is so clumsily rendered it defies belief. The movie hits its lowest point in the part where the cops come for baddie Lim Lau Pek (played by Henry Thia). Look to his character’s name, by the way, for a clue about the movie’s brand of classy comedy. The arrest scene aims for Pink Panther-style hide-and-seek hijinks, but what emerges is wildly incoherent and insultingly lazy. The United Kingdom’s ITV cancelled its dreadful sitcom Mind Your Language in 1979 after a three-year run, not because it did not have an audience. It did, especially in overseas markets such as Singapore (sigh), but because ITV management thought its awfulness, despite the few quid it was making, would stain the company’s reputation forever. There is a lesson in here somewhere. If Singh wants to trot out PCK at company dinners or in a nostalgia lounge, more power to him. But please, for the love of everything holy, keep Phua and his family out of the cinemas or prime-time TV. Instead of trying to maintain PCK Pte Ltd in its permanent vegetative state, MediaCorp must pull the plug and use the money to invest in new actors, writers and producers. Go find the next Phua Chu Kang. That, to use one of his phrases, would be using your brain. Singapore's favourite yellow-booted contractor Phua Chu Kang has made the leap from small screen to silver screen. And it ain't pretty. In an attempt to flesh out TV material for a feature-length movie transition, the film-makers have attempted to layer on emotional depth and "up" the action - literally - by turning a family comedy into a crime-caper slash mystery-adventure fit for the Scooby Gang. Only with old people instead of ghosts. Unfortunately, it ends up looking less like a film and more like a series of skits built around a barely-there story, with a handful of inexplicable melodrama thrown in. Chu Kang and Rosie (Gurmit Singh and Irene Ang) - as last seen on TV's Phua Chu Kang Sdn Bhd - are now based in Kuala Lumpur. Ah Ma (Neo Swee Lin) comes to visit but it isn't quite the social call they were expecting - she's really in KL to look after Chu Kang's abusive, thought-to-be-dead grandfather (also played by Gurmit) because the old man suspects someone is killing off the residents in the old folks' home run by the icky Lim Lau Pek (Henry Thia). Husband and wife decide the only way to keep an eye on things is to take up the job of renovating the home with Chu Kang's arch nemesis Frankie Foo (Lim Kay Siu). Snarling, bumbling and painting ensue. 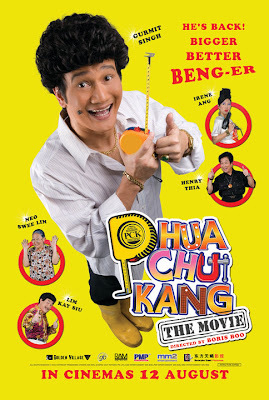 There is a lot of potential in bringing an already rock-steady brand like Phua Chu Kang to the movies. Unfortunately, it is squandered here with the strange choice of story. Rule No 1 when working with well-known characters: Don't remove them from their environment. Scooby needs to solve a mystery involving the supernatural, Bond needs to avert an international disaster, Batman needs to save Gotham from deranged criminal masterminds. Phua Chu Kang is a comedy about family dynamics - and the family we know from TV is nowhere to be seen. There's no one to play the straight man to Chu Kang's over-the-top bengness here, so everyone has a go at being wacky. This is a movie where characters often talk to themselves - and to fish, on more than one occasion. I'm not talking high-brow here. Nobody's expecting The Royal Tenenbaums - PCK needs to be knee-slappingly mass. But things get so silly in this film, it makes Phua Chu Kang the TV series look like 30 Rock. It's an unfortunate waste of a talented cast playing well-loved characters capable of so much more. The Phua Chu Kang (PCK) phenomenon is an odd one and there’s no escaping Singapore’s most famous TV Ah Beng, a character Gurmit Singh has made his own so much so he lapses into PCK ever so often in whatever he does. The yellow-booted contractor has become so recognisable, PCK has been strangely elevated to national hero status, fronting various public campaigns including one for Sars in 2003 and another for the Kindness Movement last year. Then just when you thought the series, PCK Pte Ltd, has run its course, it gets snapped up by networks across the Causeway where the spin-off, PCK Sdn Bhd, has been entertaining Malaysians since last year. Its runaway success has prompted various Malaysian production companies to finance this movie, which explains why PCK is now obliged to add Cantonese to the rojak blend of Singlish and Hokkien he spouts. Picking up from the series’ current premise, PCK is now based in Kuala Lumpur where he and his wife, Rosie (Irene Ang), get a visit from Ah Ma (Neo Swee Lin). Before she’s even unpacked her bags, Ah Ma disappears but PCK and Rosie track her down to an old folks’ home run by a smarmy CEO who goes by the name of Lim Lau Pek (Henry Thia). A lucrative construction job is up for tender at the home and PCK’s arch nemesis, Frankie Foo (Lim Kay Siu), shows up to put in his bid. Besides vying for the job, PCK also has to solve the mystery of what Ah Ma is doing at the home and why the home’s elderly residents are dropping like flies. The scattershot plot falls even below the mark of a telemovie, with annoying catchphrases shamelessly recycled and banal gags which had been done to death in the series. Sure, the cast slips into character effortlessly and wears it like a second skin; but the exaggerated acting, magnified on big screen, is as unglamorous as Rosie’s bright eyeshadow and is plain ridiculous. The below-average production values and shoddy cinematography do no favour for veteran director Boris Boo’s CV; while screen writer SM Ong wrote in a recent blog entry he hasn’t seen the finished movie and has no intention to do so. To say PCK The Movie is a half-baked and rough effort could well be the understatement of the year as it’s neither original, clever nor grand enough to warrant a big-screen outing. Yet the guffaws from the near-capacity crowd on the weekday afternoon screening we attended told a completely story. If there’s anything we can be thankful for, it’s obvious the movie is made for Malaysians and is riding on its renewed interest there. For once, we won’t challenge our neighbours for trying to turn something of ours into their own but in the interest of our newly renewed cross-straits relationship, here’s the deal: take PCK and let us take the credit for inventing bak kut teh. It has been ten years since the Singapore-made television sitcom "Phua Chu Kang Pte Ltd" (PCK) first aired on Channel 5 before going on to inspire a theatre production. Today, the sitcom has spawned a stand alone film adaptation which stars some of the sitcom's main cast. Though based in Malaysia, "Phua Chu Kang The Movie" is not a direct sequel of PCK spinoff "Phua Chu Kang Sdn Bhd". In the film, the titular hero, boorish yet lovable contractor Phua Chu Kang (Gurmit Singh) has shifted his operations to Kuala Lumpur with his wife Rosie (Irene Ang). One day, Chu Kang's mum Ah Ma (Neo Swee Lin) pays them a visit, but separates from them at a shopping mall. She is eventually found taking care of a mysterious elderly man in a retirement home run by the smarmy Lim Lau Pek (Henry Thia), who puts a multi-million dollar construction project up for grabs. However, things get complicated when Chu Kang's nemesis, contractor Frankie Foo (Lim Kay Siu), finds out about the lucrative deal and heads to Malaysia to wrest it from Chu Kang, while Lim begins to make romantic overtures towards Rosie and Chu Kang finds out about a long-kept family secret that threatens to change his life completely. It sounds like a lot is going on, but the most important thing you need to know about the film is that it is funny. While not exactly a-laugh-a-minute like the sitcom that it spun off from, "Phua Chu Kang The Movie" is nonetheless peppered with hilarious situations, side-splitting antics and well-delivered jokes that reflect the cast's comedic talents. Many of the punchlines are also delivered in their native language, be it Singlish, Hokkien or Malay, which is quite a refreshing change from the relatively straight-laced, pure English delivery in the original seasons of the PCK television series. My only complaint was that the humour can be really slapstick sometimes, veering towards annoying rather than funny. Also, it is a bit of a pity that some members of the original PCK cast such as Chu Kang's brother Chu Beng, and his wife Margaret (played by Pierre Png and Tan Kheng Hua) did not manage to make an appearance in the film, as I am sure they would have added a lot more flavour it. Still, I think the film's director Boris Boo and script writer S M Ong, who was one of the writers for the original PCK series, have managed to translate the spirit of the television series onto the film medium quite well. The movie had a clear narrative that progressed towards a conclusion instead of falling into the trap of behaving too much like an oversized sitcom episode. There were also some emotional scenes in the film that gave Gurmit some space to demonstrate his dramatic ability but alas, they were completely eclipsed by the many laugh-out-loud moments in the film. It's still pretty amazing how a caricature amongst a group of caricatures from Gurmit's World can gain enough popularity to warrant his own television series in a prime time slot, then proceed to become iconic enough with his Singlish catchphrases to feature in an American reality television episode, and now making a quantum leap to the silver screen. How times have grown for Phua Chu Kang, and Gurmit Singh of course, propelling him to stardom unimaginable when he first started out. While PCK Pte Ltd had disappeared from our local screens, the best in Singapore, JB and some say Batam had found a new lease of life up north in Kuala Lumpur, Malaysia, spreading his wings to set up PCK Sdn Bhd and surprise, has been tickling the funny bones of our friends up north, to some success as well. Naturally the feature film sees no less than four Malaysian companies involved in its production having bought into its potential, and continuing the trend in most of the commercial films released in Singapore this year, it seems these co-productions are the way to go for access to a larger audience. Directed by Boris Boo, who last had a joint stint with Jack Neo in the horror comedy Where Got Ghost?, I am starting to detect a continued Jack Neo-ish style permeating through to local films which are trying hard to fill the gap left behind by Jack, by subconsciously employing similar styles after what would arguably be Singapore's most successful contemporary director in terms of box office receipts. Things like little skits being jointed together to form a feature film, the injection of multiple languages not just to highlight our rich cultural diversity, but rather Hokkien as a language of choice. After all, PCK is a Chinese Ah-Beng contractor who should be comfortable in using his lingua franca, especially since rules for Television broadcast here have set strict guidelines on language grammar. And not to forget the many blatant product placement which feature prominently in the film at multiple points, with some being part of the backdrop, while others, like a paint company, enjoying a totally needless, unfunny scene being crafted around its shop, and mentioned in what would be pro-product dialogue. This naturally makes it very jarring to watch, since you're unsure if you're watching a commercial, or that SM Ong, the writer of the story, has something serious to say about the products featured. And like a typical Neo fashioned comedy, there will be characters, scenes and situations which are reflective of the latest hot topics in town, here drawing upon the charity donations saga about misused funds, of filial piety and about the younger generation's attitude toward the aged, money-draining charity shows, and corrupt head honchos who are fuzzy and warm on the outside, but utterly dirty and scheming on the inside. But you still have to give the story and scriptwriters credit in getting creative with the setting, because having to relocate to KL, and setting the entire film there, means the narrative can do away with PCK's brother Phua Chu Beng, his wife Margaret, and the kids, putting focus instead on Chu Kang (Gurmit Singh) and his vain wife Rosie (Irene Ang), both of whom are really comfortable in their roles like hand in glove, bringing back familiar faces like Ah Ma (Neo Swee Lin) and PCK arch-rival Frankie Foo (Lim Kay Siu). Henry Thia's filmography has grown this year, and now adds PCK under his belt with his portrayal of Lim Lau Pek, the slimy CEO of Siao Soon old folks home who has the hots for Rosie (don't ask). The star of the show, in my opinion, happens to be Gurmit Singh's dual role as PCK's grandfather, with a full backstory crafted out that allows for some hamming it up in period costumes, plus a number of scenes that stood out in comical fashion thanks to the character's presence, which provided much needed, genuine humour (forgive me for laughing at the aged) amongst many others which just fell flat. PCK The Movie also tries to employ certain jokes reminiscent of Hong Kong mo-lei-tau comedies, but these stem from desperation in mimicry which didn't work, only serving to draw attention to itself rather than to make you laugh, akin to listening to popular jokes which are told so often, it's no longer funny. I'm still skeptical about whether our local English television series can make that successful feature film jump, if the storyline continue to be an extension of what you get on television. The pacing does sputter in the beginning before finding its feet midway after getting rid of needless supporting character subplots like King Kong (Charlie Tan) and his romance with Lim's assistant manager Angel (Angie Seow) in order to focus on the tripartite challenge set by Lim for PCK and Frankie, and a rushed plot involving old folks getting bumped off as an outcome of stuffing coffers. In short, this film is only suitable for kids as it played out in juvenile fashion appealing only to that targeted demographic. When I think of National Day songs, the one that sticks in my mind is Rock DJ by Robbie Williams. What, you ask, does the Robbie Williams’ Rock DJ have to do with Singapore’s birthday? I asked myself the same question each time I heard the track played over the National Stadium’s broadcast system during the numerous National Day Parade (NDP) rehearsals I attended in 2001 when I was part of the navy marching contingent. Apparently, Rock DJ was used to accompany one of the pre-parade perfomances which I don’t remember seeing. All I remember is Williams’ endearingly quirky English-accented rapping over a sample of Barry White’s It’s Ecstasy When You Lay Down Next To Me in the song while I was waiting to march onto the field with my empty rifle and crumpled pants. Even though I still have no idea what the once-and-future Take That singer was going on about, by the billionth time I heard Rock DJ played at the National Stadium, I was convinced it was the catchiest song ever created in the history of humankind. Yes, even catchier than the Macarena (Bayside Boys Mix). But don’t ask me what the official National Day theme song was that year. 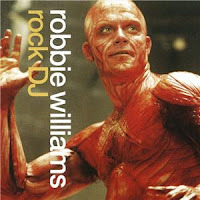 As far as I’m concerned, Rock DJ was it and Robbie Williams was our national mascot. I couldn’t agree more. Being a “world city”, we could simply adopt a recent international hit (a la Rock DJ) as our National Day song. I recommend Waka Waka (This Time for Africa) by Shakira. But the writer also suggested that we should just update the “classics”, Count On Me Singapore and Stand Up For Singapore, with “fresh, uptempo” versions. I’m surprised he left out my all-time favourite nation-building dirge, We Are Singapore. I still remember being forced to learn the song by my navy Encik during my full-time national service with fellow medics in Brani Medical Centre after working hours. It felt like we were back in kindergarten. I had survived three months in the three-door bunk on Pulau Tekong. I had survived running out of air at sea bottom during my naval diving course. I had even survived army food. But I didn’t think I would survive our dispirited, half-muttered, melody-free execution of We Are Singapore that day. I was willing to die for my country, but singing in tune was something else. Now, over 20 years later, We Are Singapore has become a cherished reminder of those youthful days (even though the song itself is kind of dreary) and I look forward to hearing it again in tomorrow’s NDP. A little Rock DJ wouldn’t hurt either. But I doubt anyone will remember this year’s National Day theme song two years from now, much less 20 years from now. Dammit, now the song will be stuck in my head all day. A few weeks ago, a New Paper colleague bragged about the wonderful free food he enjoyed at the Emirates Singapore Derby. Naturally, I confronted another colleague, TNP's wily horseracing insider Tan Thean Loon, and demanded to know why I wasn’t invited. Fearing for his life, Loon whimpered something about The New Paper Trophy race coming up and getting me an invite if I was interested. 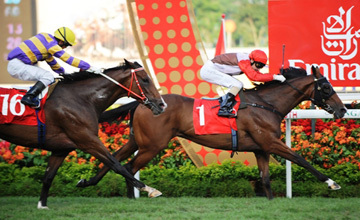 I had never been to the Singapore Turf Club before, but it had long held a certain fascination for me, especially since it moved to Kranji in 1999. 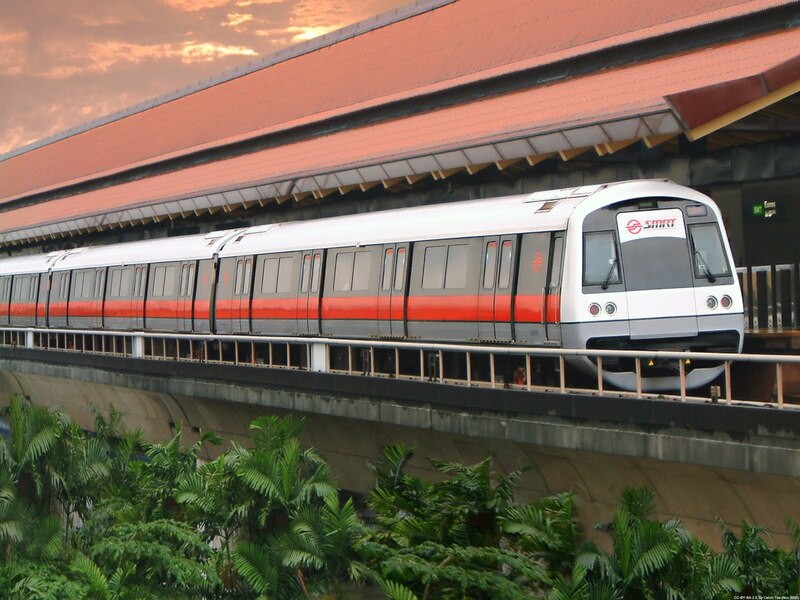 Living just one MRT station away, I had always wondered what laid beyond the line of tall trees blocking the view of the race track from the Kranji train platform. On weekends, you can’t help but notice that the passengers boarding and alighting at the station consist mostly of one demographic - men of a certain age wearing their raceday best, which for them, means shoes and a shirt with sleeves and a collar. If Wikipedia should ever have an entry on the “uncle” look, it would have a picture of one of these heroes. The New Paper Trophy race was on a Friday night. Being a cheapskate, I decided to make it a date night with my wife since the food was going to be free. I arranged to meet Loon inside the turf club. Stepping into the lower grandstand reminded me of the last time I was in Paris - I was overwhelmed by the smell of cigarette smoke. Fortunately, the free food was in some VIP room upstairs on the "club level", which was air-conditioned and smoke-free. But as Loon was taking my wife and me to the lift, we were stopped by a turf club employee. She said I had to wear a tie and tuck in my shirt. I said I didn’t have a tie. She took out a fat, shiny, pastel blue tie from under her desk and told me to make sure I returned it later. Right, as if I was going to keep it. Loon had warned me about the dress code, but had erroneously told me I didn’t need a tie even though he was wearing one himself. I let him live anyway. Ironically, before we were stopped, I was actually worried about being overdressed after seeing the berms-and-sandals crowd at the lower grandstand. I haven’t worn a tie since my last failed job interview, much less a borrowed one that didn’t quite go with my $10 Cotton On shirt I bought on sale two Christmases ago. But for free food, I was willing to make the fashion sacrifice. “Just be grateful they didn’t make you cut your hair,” my wife snarked. It seemed unfair to me that women weren’t also required to wear a tie – perhaps around their mouth. I kid because I love! With its lower grandstand, upper grandstand and club level, the turf club takes its class segregation very seriously, even integrating it into its building plans and enforcing it with sartorial requirements. 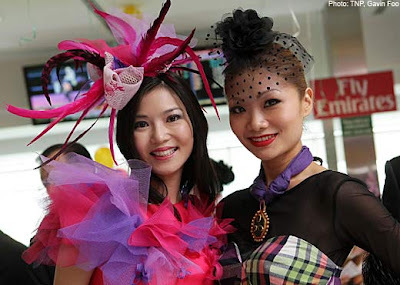 It may deploy the latest in modern information technology to assist punters in losing their money, but the turf club is still proudly old-fashioned, preserving anachronistic, almost surreal traditions like special days where ladies get to wear funny hats. I had to wear a funny tie. But the black pepper baby lobster made it all worth while. Then my wife wanted to play the ponies and asked Loon for advice on how and what to bet. And just like that, we lost $30 in a single race (three times what I paid for the shirt I was wearing). It’s true what they say: There’s no such thing as a free meal. I was devising several satisfying ways to kill Loon when my wife won most of our money back in the next two races, including The New Paper Trophy race. So Loon got to live to offer racing tips another day. But we were still down by a few bucks. I looked down at my borrowed tie and wondered how much I could get for it on eBay. I should’ve just eaten more baby lobster. I've already made a date with my wife for next year's New Paper Trophy race.